Business Development Director Paul Eastwood suggests a radical fresh business model is needed for the Australian food industry. In the UK we take our fresh meal choice as a given, whether that be a hot smoked salmon salad from Waitrose, a shepherd’s pie from Charlie Bigham, or even a handmade pizza, the options are endless and the quality exceptional. The NPD engine continues to churn out great products such as the “fuller for longer” range at M&S, but we also take it for granted that the basics ranges across the industry are fresh too. Having spent the past few months meeting new clients all over Australia you start to get a feel for its scale. With a population of only 22m spread over 7.7m km2 it is 32 times the size of the UK with only a third of the population. How can you deliver a fresh business model in a landscape such as this? The food industry in Australia is going through some challenging yet exciting times. However, due to the sheer scale of Australia a number of the approaches adopted in the UK and Europe are not transferable. Around 75% of the population live within 16hrs of Sydney so with access to only 16.5m people the market is not big enough for a limited range business. The cost of distribution could be an estimated 500% higher than in the UK based on pallet fill and travel time. The market is unknown so it’s a risky venture without knowing whether demand will cover the capital outlay. If the fresh revolution is to be a success in Australia, I believe manufacturers and retailers should collaborate on distribution networks, consolidating and delivering product through depots or direct to store at a rate unparalleled around the globe. 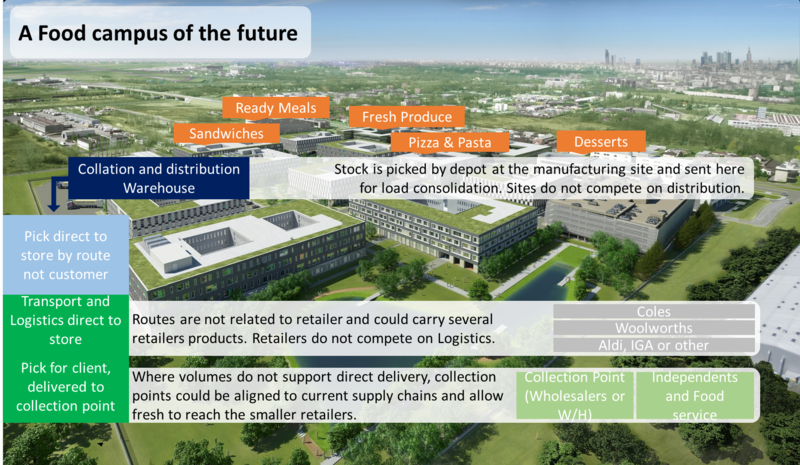 The campus would shorten the supply chain, optimise the cost of distribution, and provide full access to the major markets. It would prompt a step change, de-risking the investment and putting fresh beyond more than just the multiples. Collaboration is the first step. What’s the Goal – are businesses and humans so different? Humans set personal goals and aspirations. They inspire and when we truly believe in them we connect at an emotional level. Why should organisations be so different? Customers increasingly demand more for less – it is a fact of life. Businesses respond through novel products and services, branding, marketing, and other value-add differentiators. Eventually the long-term success of a business depends on its ability to continue delivering value at a competitive cost. Reducing cost is an ever-present challenge in supply chain operations. Companies go through waves of attacking waste and removing cost through departmental and functional initiatives, all promising to strip out cost and boost margin. Usually these initiatives start at Board level and are cascaded and dissected through various levels of leadership. By the time these targets arrive with those actually adding value, the context and the ‘WHY’ is often unclear or even absent. The lack of context and clarity stifles motivation and inclination from those on the value streams who best understand the process and are making the minute-to-minute decisions directly influencing cost and actual margin. ‘Why’ and the big picture? Employees value being treated with respect and not left in the dark. With your most creative and influential assets, don’t go straight to the ‘What’ and ‘How’ before taking the time to explore the ‘Why’. Strategy can mean different things to different people. Making it personal, relevant and inspirational will help them see the key role they play and how they can engage and contribute with pride. How does it all fit together? The volume of measures, initiatives and requirements can be overwhelming – taking the time to link back to the big picture will encourage understanding, challenge and support. Some will have seen it all before. There will always be those that choose to look through darker glasses – encourage dialogue and ideas in order to learn from the past; transformed cynics can become strong advocates. Build on the good work already done. Strategies should connect to provide a clear and simple story. Take time to explain how they build on each other to drive the business forward in the context of external forces. So how best can we stimulate understanding and align and inspire the hearts and minds of an organisation to unleash its potential? Humans set personal goals and aspirations. They inspire and when we truly believe in them we connect at an emotional level. Why should organisations be so different? Organisations by definition need to make choices on how to organise resources to deliver a purpose and a goal. If we as individuals disagree with a goal, it becomes very clear, and we can work out what we need to do to either get ourselves aligned or get out. Why is a goal so important? What should be considered when setting a goal? Consider a company producing gas turbines from tens of thousands of parts. As time passes its successes result in higher sales of a broader portfolio delivered through an organically evolving supply chain. Following its successes the company is now in a position where some orders have backlogs of several years with delivery commitments, inventory levels and quality all struggling to meet expectations. Business processes had evolved to become overly complex, supply chains and warehouses clogged and functions all trying to improve in isolation. So what happened…? The Company recognised it had to do something quite different before it lost market share, and the workforce was engaged to find a way of focusing and aligning efforts. Whilst the future state could have been described as a series of KPIs, the Company decided to identify one measure that could focus the organisation, and if achieved would drive the other measures in the right direction. The goal was set based on a maximum number of calendar days to produce the product from launch to delivery – the 40 Day Engine. This goal, embraced at Board level, peaked curiosity in every employee and forced them to gain a clear understanding of the part they could play in making it happen. 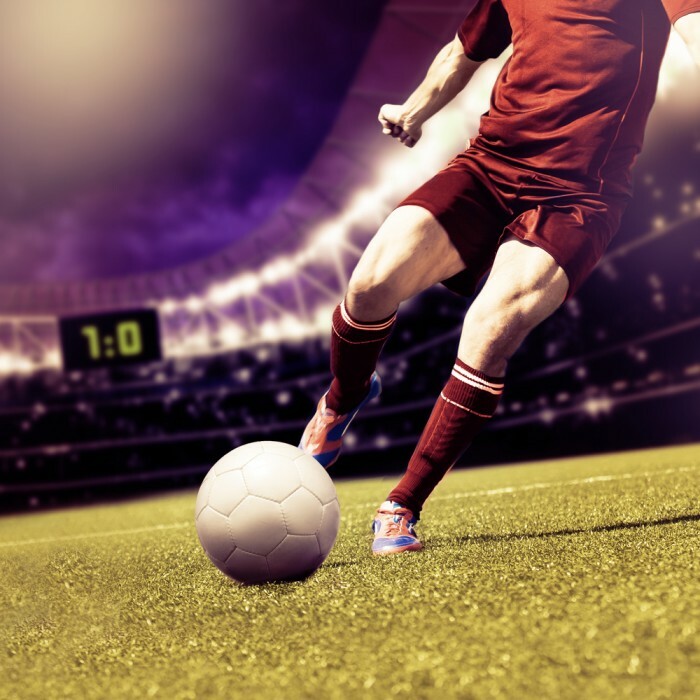 Every function and team analysed, improved and (where required) re-engineered their processes and activities to be in a position to support the goal. Week by week it was clear how the Company was doing on its common journey towards the goal and evident where areas required further support and creativity. Life is full of surprises and unintended consequences. This Company was no different – in this case the risk involved increasing inventory levels to accelerate service orders from stock. This was quickly anticipated and managed using a balanced scorecard approach. Once these unintended consequences were mitigated it started to drive the behaviour and focus on JIT and Lean processes, product quality, planning, data and velocity through the end to end supply chain. Finally, and possibly the most important aspect of a goal driven organisation, is to openly discuss the goal and allow the options, decisions and solutions to be driven and owned by those operating the processes. To this end the organisation placed great emphasis on encouraging multifunctional groups to come together and challenge, understand and discuss the goal at the start of the process and throughout. The communication was not treated as a one-off, one way, top down process that is assumed to happen flawlessly, a necessary evil – rather it was an ongoing dialogue and opportunity used to generate understanding, alignment and solutions. As we humans reflect on our progress towards our personal goal, we make adjustments all the way by talking to people, trying and testing out, until we eventually get there, but we always know where there is. Given companies are driven by humans it stands to reason that this is a powerful mechanism to exploit.